All KINDS of Sneak Peeks! Hey guys! As some of you know, I have a newsletter with my fabulous co-author, Amie Kaufman. On it we do share news about our books, but we also include articles about the industry, interviews with other professionals like editors, agents and other authors, and behind the scenes glimpses. This month, though, we’re going to have an absolute doozy of a newsletter. 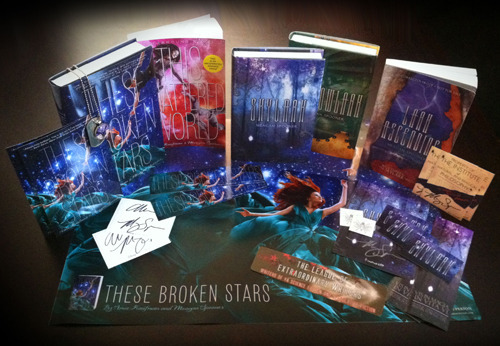 So we wanted to let you know, in case you wanted to subscribe and get the cool stuff! 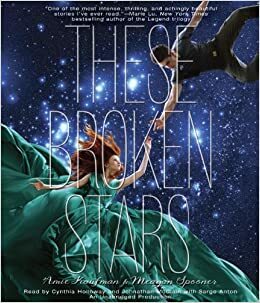 Firstly, we are going to be sharing the first ten minutes of the THESE BROKEN STARS audio book, from Listening Library, with our subscribers! Guys, let me tell you, this is like no audio book I’ve heard before. I’m not just saying that because it’s mine—it really is unique. They hired not one, not two, but THREE narrators–one for Lilac, one for Tarver, and one for the interrogator between scenes. And the narrator for Tarver, Johnathan McClain, emailed us to let us know how much fun he had, and told us that he actually got to be in the recording booth with the interrogator during those scenes, and that it was more like a play than a narration. COOL, right? Secondly, and perhaps the only thing even more exciting than the audiobook sample, is that we are announcing the title of book two in the Starbound Trilogy! (Plus, a little tidbit as to what the book will be about.) It’s been a closely-guarded secret for over a year (yes, we knew the title even then) but we’ve finally gotten the go-ahead to share it. So, tune in for the newsletter next week. As promised, it’ll be a doozy.